Are you not getting the expected benefits from the hormonal pills and thinking of switching to Spironolactone for acne and PCOS? The use of Spironolactone for acne dates back to more than two decades. Interestingly, it was almost the same time when the researchers accidentally discovered its benefits for the women with PCOS. Since then, there have been numerous attempts at finding its effectiveness in these conditions. Continue reading to know if you could consider taking spironolactone for acne or pcos. Spironolactone is a potassium-sparing diuretic. It prevents the loss of potassium through urine. Primarily, doctors prescribe it for the patients who have high blood pressure and edema. In addition, it can also be used to restore the electrolyte balance when the blood potassium level dips. It works by increasing the excretion of water and sodium in the urine. You can take it by mouth. Before we learn to explore the link between acne and PCOS, let’s first know what these conditions really mean for us as women. It is a disorder of hormonal imbalance. Having PCOS generally raises the level of male hormones (androgen) in your blood. Thus, you get male-like physical signs such as excessively oily skin, acne breakouts, excess hair on the face and body (hirsutism) and loss of hair from the scalp. Other symptoms include irregular periods and presence of follicles in your ovaries. As a result, the ovaries may grow in size. Your risk of PCOS is high if you are of childbearing age. Obesity worsens the symptoms and acts as a major risk factor. If you fail to get an early treatment, some serious complications may follow. For example, diabetes type 2, heart diseases and infertility. Acne is a common skin condition that affects both males and females predominantly during puberty, however adult acne is very common. This article focuses on the acne that occurs in older women, adult-onset acne. According to the American Academy of Dermatology, the primary cause of acne in women is an imbalance in the hormonal levels. When you have an excess male hormone, the oil gland becomes overactive resulting in clogged hair follicles. More than just painful zits, acne can be a serious blow to your self-confidence and self-image. As mentioned above, PCOS typically results in an excess of male hormones in a woman’s body. This is exactly the same reason why PCOS patients also have severe acne. Thus, it is clear that hormonal imbalance is a primary reason behind both acne and PCOS. If you have acne along with the other symptoms of PCOS, you should get your hormone level tested. According to a study, acne is present in about one-fourth of the women with PCOS. Before we answer this, let’s have a quick reminder. The US FDA does not approve the use of Spironolactone for treating acne and PCOS. This means the manufacturer cannot claim such use in their label (that’s why it is known as “off-label” use). Nonetheless, the drug watchdog does not prevent the physicians from prescribing it. As a matter of fact, a doctor endorsement of Spironolactone for acne and PCOS is still controversial. According to a 2017 study published in the American Journal of Clinical Dermatology, there is limited evidence to support its use in these conditions. However, based on clinical evidence and some research studies, your doctor may it to treat acne in older women and PCOS. You have other PCOS treatments such as hormonal contraceptives and Metformin. Traditionally contraceptives are prescribed to provide relief from common menstrual problems. Contraceptives may be used in combination with an anti androgen. But the real problem with the contraceptives comes from their inability to affect the blood glucose levels. PCOS and high blood glucose levels, a hallmark of diabetes, co-occur in many cases. Also, contraceptives are not free from side effects. Most notably, persistent amenorrhea (missed periods) is something that can linger even long after you have discontinued the pills. This is where Spironolactone has an upper hand. Study shows taking it by mouth for 6 to 9 months can provide a significant relief from most of the characteristic features of PCOS. For example, hirsutism, acne, white scales on the skin, and loss of hair. You may be able to reap the benefits even after stopping the drug. How Does Spironolactone Work To Ease Acne and PCOS? Spironolactone have been found to be an effective anti androgen drug. Thus, it counteracts the physical effects of the male hormone, androgen. That way, it might help to ease the effects that arise from an excess male hormone. For example, acne, hirsutism, and menstrual disturbances. Spironolactone shows its anti androgenic effects by two ways. First, it prevents the androgen from binding to its receptors in the cells. Next, it blocks the activity of an enzyme that converts the androgen into a more powerful form. While the use of Spironolactone as a second-line treatment of acne is sufficiently backed by the studies, the same cannot be said in the case of PCOS. Thus, talk to your doctor about its risks and safety. Also, be sure to ask about the drug’s effect on your fertility. Natural Alternatives To Spironolactone: What Can You Do To Restore The Hormonal Balance? If you are like many women out there who suffer from adult acne and seeking natural alternatives, you are not alone and there are many promising natural remedies that have been shown to be effective. Making some simple yet effective lifestyle tweaks can go a long way to helping you get the desired relief. Here are some measures you may want to try. Exercise on most days of the week. In the article How to Naturally Reduce Androgen Levels in Females, we share a study that shows the positive impact of exercise on reducing excess male hormones in women. How many times have you been hearing about the benefits of an exercise to your health? Definitely, this is not the first time. And, we repeat, you should exercise not just to have a well-toned body but also to get relief from common female problems like acne and PCOS. Among numerous benefits, the most notable is the effect of a regular exercise on your mood. Both acne and PCOS can lead to a depressed mood. When you exercise, the feel-good chemicals in the brain surge and give you a sense of well-being. Maintain a healthy weight. Obesity is one of the major causes of a hormonal imbalance, the root of acne and PCOS. Losing weight is particularly helpful in getting back the normal menstrual cycles. Additionally, it can make you feel good about yourself, a natural source of happiness and motivation. 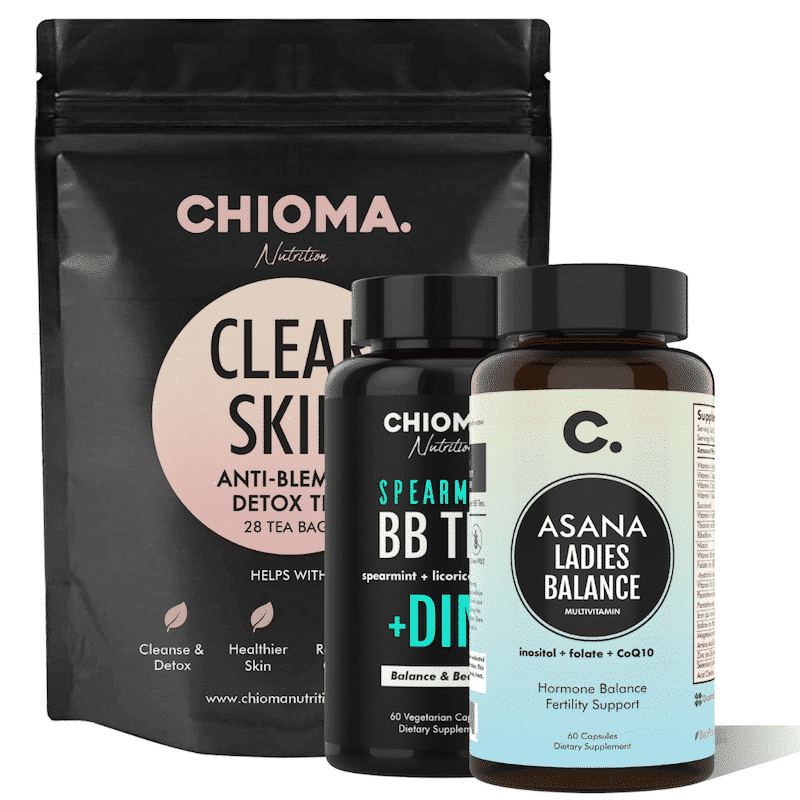 Related: How Do You Treat Female Hormonal Acne Naturally & Get Clear Skin? Eat healthy foods. Increase your daily intake of fresh fruits, vegetables, nuts, beans, and whole grains. Cut down on high-fat and refined foods. That way, you will also be able to maintain a healthy weight. Try Green Tea. There is enough evidence to suggest that green tea could be beneficial for both acne and PCOS. Not to forget that it is an effective weight-loss supplement as well. You may also use green tea topically on the skin to reduce acne blemishes. Here is how? Add 2 tbsp. of loose green tea leaves to 250 ml of boiling water and continue boiling for 10 minutes. Allow it to cool. Dip a washcloth into the solution and apply the wet washcloth on the skin for at least 5 minutes. 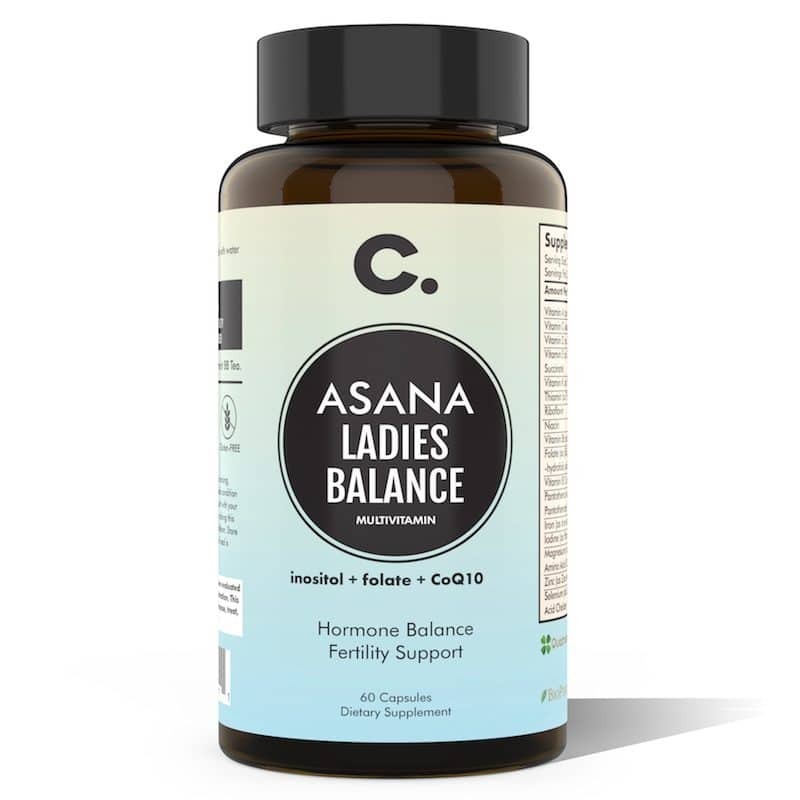 In our Asana Beauty Bundle, we harness the power of green tea in our Asana by LadiesBalance, Femininitea Spearmint and Femininitea Clear Skin to help detoxify the body and reduce excess male hormones in the body that may be the cause of unpleasant symptoms. Further Reading: How Green Tea Helps To Restore Hormone Balance? Use Spearmint To Get Relief From PCOS. Here is how you can use Spearmint for PCOS and Hormone Imbalance. Trivedi, MK., et al. “A Review of hormone-based therapies to treat adult acne vulgaris in women” International Journal of Women’s Dermatology 2017 Mar; 3(1): 44–52. Grandhi, Radhika., et al. “Spironolactone for the Treatment of Acne: A 4-Year Retrospective Study” Dermatology 2017. Kim, Grace K., et al. “Oral Spironolactone in Post-teenage Female Patients with Acne Vulgaris” The Journal of Clinical and Aesthetic Dermatology 2012 Mar; 5(3): 37–50. Callan, Annette W. “SPIRONOLACTONE THERAPY IN HIRSUTISM AND ACNE” Australasian Journal of Dermatology 1998. Rathnayake, Deepani., et al. “Innovative use of spironolactone as an antiandrogen in the treatment of female pattern hair loss.” Dermatologic Clinics 2010 Jul;28(3):611-8. Layton, Alison M., et al. “Oral Spironolactone for Acne Vulgaris in Adult Females: A Hybrid Systematic Review.” American Journal of Clinical Dermatology 2017 Apr;18(2):169-191. Badawy, Ahmed., et al. “Treatment options for polycystic ovary syndrome” International Journal of Women’s Health 2011; 3: 25–35. This entry was posted in Balanced Beauty, Balanced Health, Health, Hormones & PCOS and tagged Acne, herbal remedies, PCOS, spironolactone.